Did you know that five of the past seven Stanley Cup Champions have come from the Western Conference? Well now you do! The Los Angeles Kings have now been in three straight Western Conference Finals, while the Chicago Blackhawks have been in the last two and appeared in four of the past six. The players on LA’s roster vs Chicago for Game 7 last night are now 84-2 in Game 7’s, while in the Jonathan Toews/Patrick Kane era their Hawks are 26-5 in Games 5, 6 & 7. Those in tonight's #LAKings lineup have a combined record of 64-2 in Game 7s. Only losses: Greene, Stoll in 2006 SCF Game 7 with Edmonton. Williams had an empty netter for Carolina that night. The more it went on, the more it reminded me of the late 1990’s when the Detroit Red Wings, Colorado Avalanche & Dallas Stars dominated the West: from 1996-2002 the Avs made six appearances in seven years (! ), the Stars made it to three consecutive (1998, 1999, 2000) and the Wings were there four times. In fact from 1996-2002 the only other team to appear in a WCF was the St. Louis Blues (2001). In that time period only one Eastern Conference team won the Stanley Cup – the New Jersey Devils (2000, 2003). The Kings-Blackhawks series’ the past two seasons specifically reminds us of the 1999 & 2000 match-ups in the West Finals between the Stars-and-Avs; both won by the Stars, both in epic, seven-game series. Both team’s rosters are quite the collection of players: Chicago rolls out Toews, Kane, Patrick Sharp, Marian Hossa and Duncan Keith night after night, and I think most of us would agree they are all/have the potential to be ‘perennial’ all-stars. Same with Los Angeles, boasting names like Anze Kopitar, Jeff Carter, Marian Gaborik, Drew Doughty and Jonathan Quick. Colorado was no joke back then, bolstering a lineup with Joe Sakic, Peter Forsberg, Milan Hejduk, Adam Foote, Chris Drury Alex Tanguay and Patrick Roy. Dallas was equally loaded with Mike Modano, Joe Nieuwendyk, Brett Hull, Jere Lehtinen, Sergei Zubov, Derian Hatcher and Ed Belfour. All four teams predominantly mentioned above, five if you include Detroit, have all had rotating parts of their teams as the years go on and the match-ups evolved. But they all had that solid, leadership core; possessing a boatload of intangibles that doesn’t always show up on a stat sheet, scorecard or fancy stat tracker. Most importantly, they are all dangerous to play against because on any given night, in any given game, anyone could score. 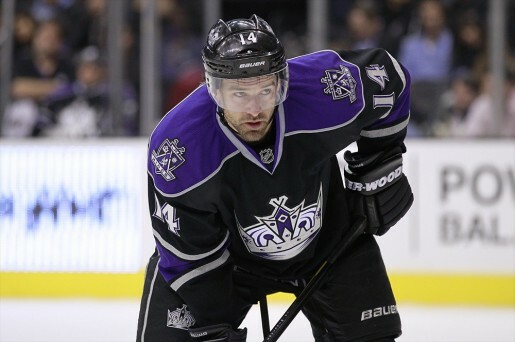 We all know the numbers when it comes to Justin Williams and his incredulous stats in 7 career Game 7’s (7g-7a) with the Kings (and Carolina Hurricanes, Philadelphia Flyers); the only other NHL player that has seven, game 7 goals in NHL history is the great Glen Anderson. Williams’ 14 points also passed Doug Gilmour for most ever in career Game 7’s. Oh by the way, Williams’ teams are 7-0 in those seven game 7’s and he has at least a point in every one of them. With a 1st period goal, @LAKings Justin Williams ties G. Anderson (7) & D. Gilmour (13) for first on all-time Game 7 goals & points lists. Detroit’s teams wouldn’t have been successful without the Grind-Line of Kirk Maltby, Kris Draper & Darren McCarty. The Blackhawks have gotten timely contributions from youngsters like Brandon Saad, Marcus Kruger, AndrewShaw and wily vets like Michal Handzus, Brian Campbell, Andrew Ladd, Dustin Byfuglien or Brian Bickell. The Stars always found production in the likes of Jamie Langenbrunner, Darryl Sydor, Guy Carbonneau and Mike Keane. 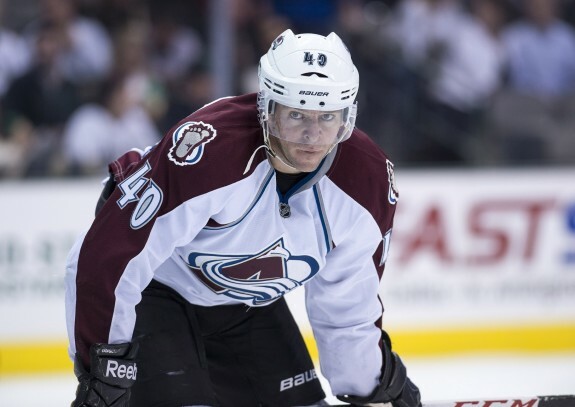 The Avalanche always added pieces that fit into their model seamlessly, whether it was Rob Blake or Raymond Bourque, or getting production from unlikely heroes like Stephane Yelle or Ville Nieminen. As always, goalies make a huge difference, and Quick is no different for the Kings than Belfour was to the Stars, Roy to the Avs. All obviously beatable, but man was it/is it hard to beat them in a seven-game series. With his third Game 7 win this postseason (all on the road by the way) Los Angeles’ goalie is now 4-0 all-time in seventh games; oh and he won the Conn Smythe Trophy in 2012. Hossa has been in the Cup Final four times over his career (2-2 record) but then there is Carter & Mike Richards who were cast aside by the Flyers after a Cup run in 2010. They both found their way to LA (Richards via trade, Carter via two trades) and now are primed to win their second Cups in three trips to the Final. The Kings have a bunch of players that have been instrumental to their three straight WCF appearances, but has anyone (other than Williams) scored any bigger goals (or more) than Carter? He’s tied with four other legends in NHL history as the only players with two hat tricks in a Conference Final. Okay, that was a lot of info that may have seemed discombobulated at times, but the bottom line is this: the West has been DOMINATING the East as of late (when it matters most), and it doesn’t seem like that speeding locomotive can be stopped anytime soon. Season after season the West has become a gauntlet to make it to the Final, and honestly, it probably prepares them much better to play tougher teams along that path to the Cup. Back in November Kopitar told the Hockey Writers: “I think we’re on the right path. There’s still another level that we can reach and we are striving towards that.” One would think if we asked the Anaheim Ducks, San Jose Sharks and Blackhawks that the Kings have reached that level. 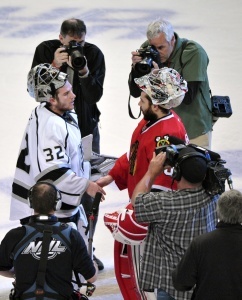 The seven game Hawks-Kings series we just witnessed – probably the best series we’ve seen in a looooong time. Epic. Thrilling. Blown leads. Historic comebacks. Overtime. Game 7. Overtime in Game 7. Very reminiscent of (not so) Old Time Hockey that we saw with the Stars and Avs; here’s hoping next year we see round three in the WCF between Chicago and Los Angeles. Good luck New York Rangers. An even series on paper, likely another seven gamer, but what scenario haven’t the Kings had to face over the past three playoff seasons? 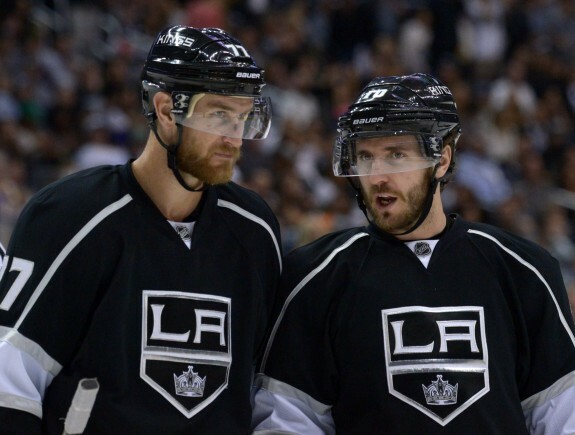 From Kopitar to Kyle Clifford, they’ve seen it all. Good luck Eastern Conference for the foreseeable future; The West is Best, again. And it doesn’t look like anything is going to change anytime soon.